There’s no question that the E92 M3 is an outstanding car as it came from the factory. There are, however, a few tweaks, that can unleash the beast that’s within. Now that these cars have become more affordable and adding a few of these mods really great car even better. If you like performance events such as autocross or track driving, they can make a ton of difference in how it holds up on the track. 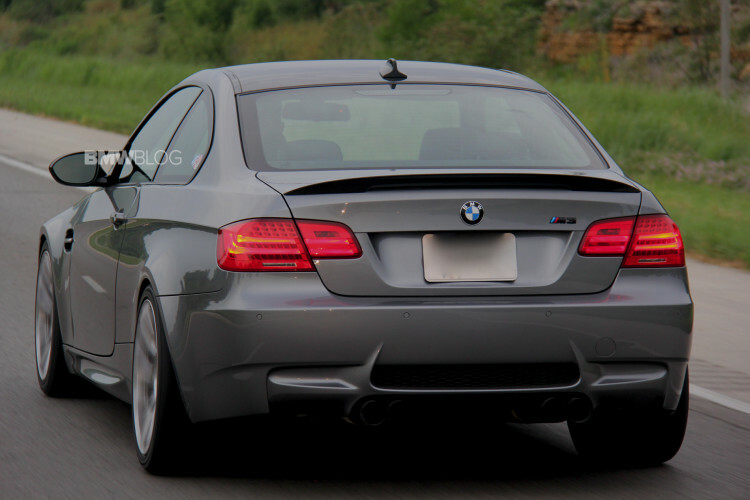 Akrapovic is the gold standard on after market exhaust; for the E9X M3 runs $3,600 from Turner Motorsport. The Dinan exhaust is nice because it maintains the stock look, if you are trying to be more subtle and runs about $2,500. BMW Performance exhaust is made with Iconel, a superalloy developed initially for Formula 1, which is also a very nice choice, but is the most expensive option at over $4,000. All three sound awesome, but Akrapovic is our favorite. Lastly, Corsa makes a nice one too and was very happy with the one I had on my E36 M3. Every time I see the early E92 M3 with 18” wheels and stock suspension, I groan inside. Oh the fender gap. The athletic stance you get when you add some nice springs, such as the H&R Sport Plus Springs, which lower the car and offers a better stance. The M3’s turn in improves, body roll decreases and the M3 is more composed over bumps, though some say the ride can be more harsh. The benefit of the H&R springs is that they can work with BMW EDC (electronic damper control) shocks which have adjustable stiffness. The “money no object” suspension mod is KW Coilover Kit at $3,500-$4,100. I just went with the springs and OEM EDC shocks, about $300 + install and alignment. Depending on the age and mileage of your M3, you could make a case of doing this first. Remember, in the mod’ing world, anytime something wears out, it’s always a reason to upgrade. 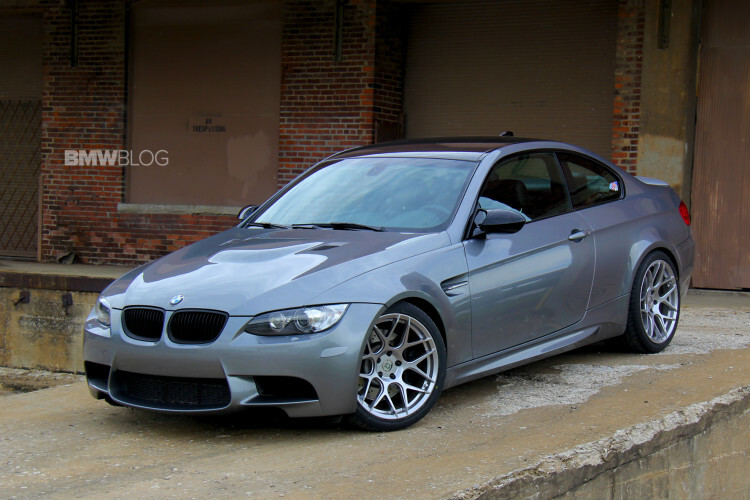 The need to change your wheels or not really depends on which ones come with your M3. 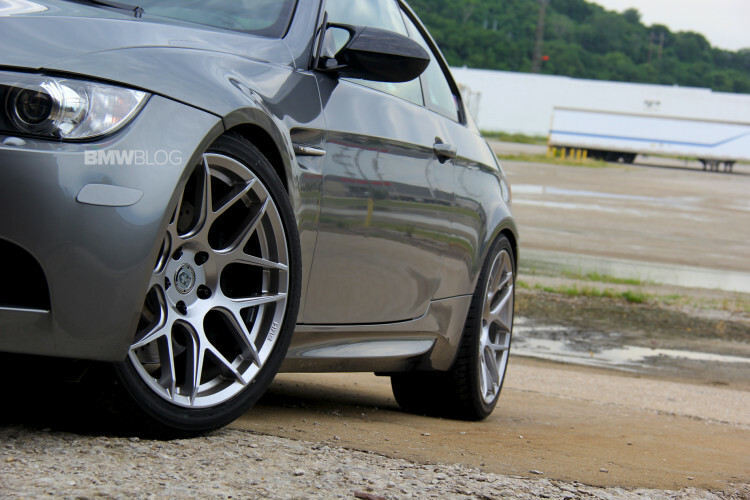 If you have the base M3 18” wheels, this would be one of the first things I would change. My 2011 came with the very nice looking 19” BBS wheels that were part of the competition package. My resolve to not change these, however, evaporated when HRE released their FlowForm wheels. Though these are not forged wheels, they are made with a special process that makes them as strong as a forged wheel but at significant cost savings. Whether or not you like a particular style of wheel clearly falls in the subjective category, but to me there is no question these HRE wheels look much better than the 18” stock wheel that came with the E92 M3. Another benefit of an after market wheel is the ability to get more grip under your M3 to help put the power down and keep you planted in the corners. Check out how much extra rubber is on the ground with the HRE’s compared to the 19” BBS Comp Package Wheels – almost 3 inches. Down side is, of course, lower overall sidewall thickness can make your M3 more prone to damage from crap roads found, well most everywhere in Chicago. The HREs I run are 19×9” front wearing 255/35/19 and 19×10.5” in rear shod with 295/30/19s. Compare that to the stock 18s wearing 245/40/18 and 265/40/18’s and an extra 40mm gripping the road with these HREs. 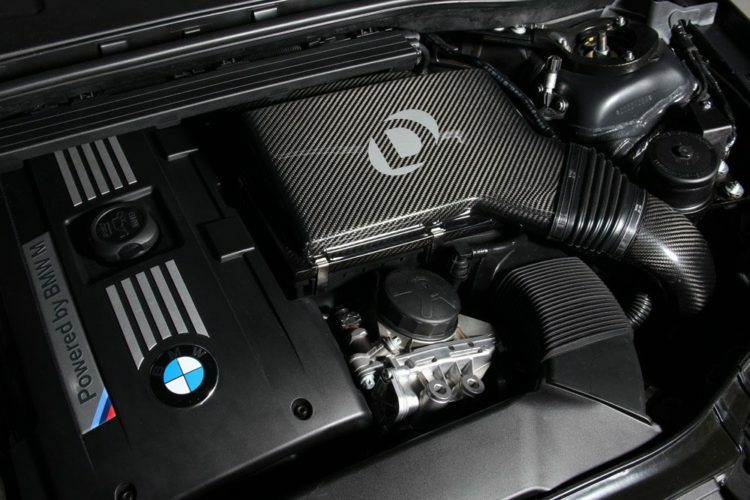 BMWs always seem to come with some air intake restrictions – be it from noise ordinances or other regulatory reasons. An after market cold air intake removes the large clunky box under the hood on drivers front where air is channeled into the motor. In our case, we added a carbon fiber Dinan intake, not only is this functional but the carbon fiber saves weight and looks gorgeous. Intakes from Dinan run just over $1,000. In addition to providing more air for the motor, they are also less prone to heat soak. AFe makes some nice air intakes too and I was happy with the one I had on my E36 M3. Nothing beats the more aural induction noise you get right when you first step on the gas pedal with this mod. Apparently some intakes are not legal in the state of California, probably causes cancer in lab rats, or something. To quote an old editor of mine at Roundel, some BMW’s manual transmission throws feel like a “long spoon in the tapioca.” Basically, it means the manual transmission gear selector is too tall and the throw too long. The best way to address this is in a BMW is with a short shift kit. I had one in my E36 M3 and installed one in a E46 M3. A safe second option is to go with a ZHP shifter which is a shorter shifter, but doesn’t change the linkage. This is we opted for in my 2011 M3 as it costs less and install is much faster. 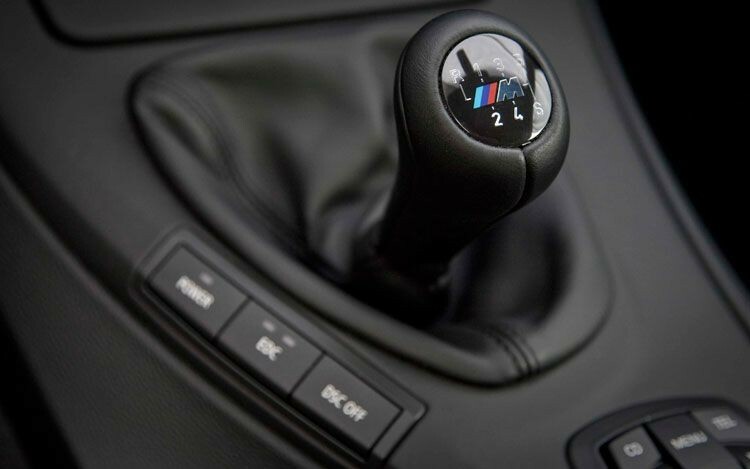 For those M3s without a manual transmission, this would be my fifth choice for a Top 5 Mod. Coding can change things such as dispatching the annoying auto start-stop, or even changing blinker cadence. I found auto-start stop on the M3, a fuel saving trick, to be annoying and if you wanted better fuel economy, you wouldn’t be driving a 400+hp V8. Coding can have added benefits when paired with intake/exhaust and yield gains up to 40 hp and 32 ft-lbs of torque. It’s also very easy to do and, yes I’ve coded my E92 M3 too. 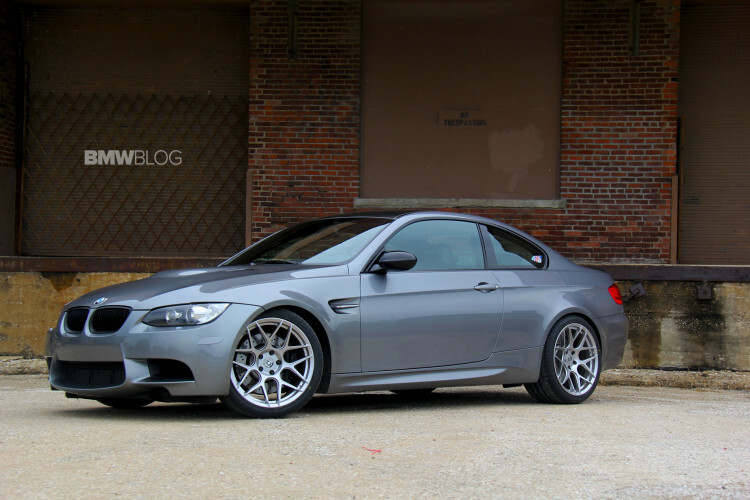 These five mods enhance an already great BMW. Admittedly, in my case, I am a modaholic and one mod begets another. Each time I get a new car, I swear off the mod bug and then I start with just one thing. Oh and track guys love the big brake kit mod for the E9X M3, especially the Brembo one.